Dave Showalter does not need words to convey his message. In his new book, Sage Spirit: The American West at a Crossroads, the photographs of valleys of grazing buffalo and the ostentatious plumes of the sage grouse are powerful in their own right. These images are taken throughout the yawning basins and wide plateaus of the Intermountain West, far from urban and suburban America. Showalter’s photographs showcase the Sagebrush Sea, a national treasure that will be lost if we do not join the effort to preserve it and its iconic inhabitant, the endangered sage grouse. His message, conveyed primarily through photos but reinforced by essays, is loud and resounding. While he photographs a range of landscapes and animals in the Intermountain West, he has focused his advocacy around the Greater and Gunnison Sage-grouse, whose population is declining by 2% per year. The distinctive bird reflects the health of the entire sage steppe, an important winter habitat for elk and mule deer, a migratory corridor for birds and an emblem of the American West. Amid heated debate, it has been the work of conservationists like Showalter to spread awareness and rally the public to urge policy makers to protect the sage grouse and its habitat. Many people have never seen sage grouse, and aren’t familiar with the sage brush ecosystem. Dave Showalter’s book says, “Look for yourselves,” and the beauty of the photographs themselves capture us. The Interior Department announced today that it will not be listing the sage grouse on the endangered species list after months of deliberation, but the decision will not affect Dave and other conservationists’ advocacy work. How did you decide to devote yourself to documenting this landscape at a turning point? The energy rush of the early 2000’s was consuming huge chunks of western lands – land that we own, converting critical wildlife habitat and places where people like to recreate into single use industrial zones. There really was no landscape plan, just lease and drill. No ecosystem can sustain that intense pressure from development and I knew something had to change. What have been the biggest challenges in drawing public attention to the conservation of the Sagebrush Sea? One is just helping people understand what and where the sagebrush ecosystem is. People are willing to stand up for places and creatures they love and my job is helping folks to understand that sagebrush is the fabric that holds the west together. Given the U.S. Fish and Wildlife Service decision, how will you direct your advocacy? Will you continue to focus on the Sage-grouse? The USFWS decision won’t change my advocacy much. Greater Sage-grouse are our iconic western bird – they spend their entire life cycle in sagebrush. A number of species are declining at a rate that parallels the 2% per year decline of Greater Sage-grouse. Brewer’s sparrow, for instance are declining at the same rate. Sage thrasher, sagebrush sparrow, and even mule deer are also losing ground. Americans like wide open spaces and wildlife, and we need to be engaged in decisions about land use and the value of this remarkable ecosystem – the world’s only sagebrush ecosystem. I’ll continue focusing on Greater and Gunnison Sage-grouse and do my best to share the magic of the sagebrush sea. 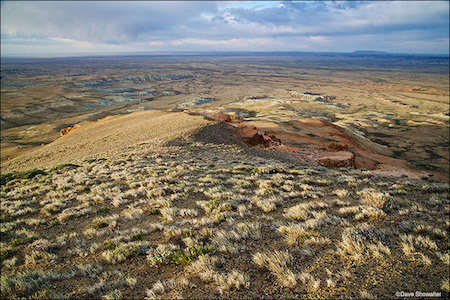 What gives you hope for the future of the sagebrush ecosystem? First, the US Fish and Wildlife Service and Bureau of Land Management have developed an 11 state, 165 million acre Priority Areas For Conservation (PAC) plan to give Greater Sage-grouse a chance at recovery. The eleven sage grouse states each have plans that are aligned with the PAC, so we have a landscape scale plan that will also benefit the 350 other species who depend on healthy sagebrush. A number of conservation groups, including Audubon, The Wilderness Society, and The Sierra Club are working from ground to policy levels, collaborating with a long-term vision of sustainability. People, or stakeholders from very different viewpoints are coming together to collaborate for good conservation plans range wide. In Gunnison, Colorado, the entire extended Gunnison community is working together, collaborating to improve habitat conditions and implement a range of solutions to save the Gunnison Sage-grouse. Gunnison has set an example of what is possible, and I’m hopeful when I see people seeking ways to work together for a place or an animal they love. We need more of that. Visit the Sage Spirit website to learn more.